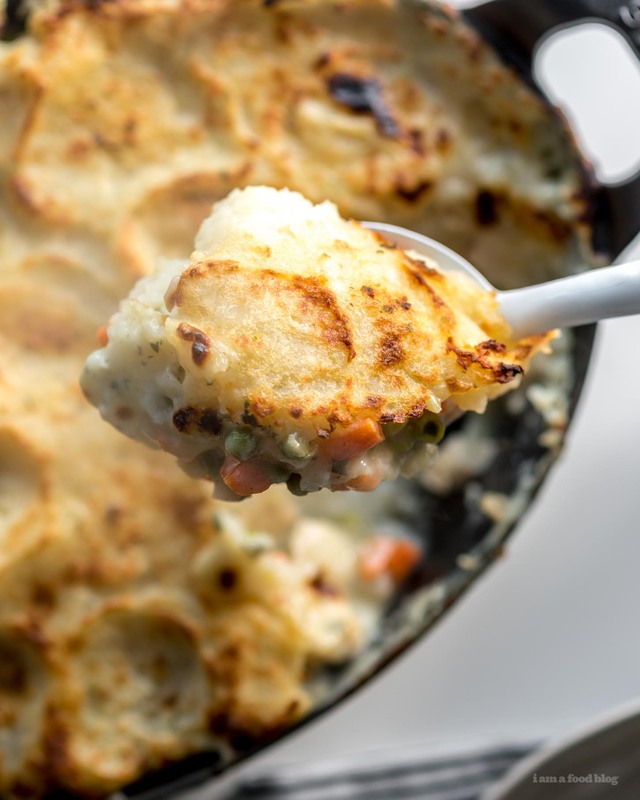 A shepherd's pie take on turkey pot pie: tender chunks of turkey, carrots, and peas in a creamy béchamel, topped off with fluffy garlic mashed potatoes. Pure comfort! As much as I love Thanksgiving at home with family, I think I might like Friendsgiving even more. Shh, don’t tell my mom though. It has nothing to do with that time my mom accidentally locked the turkey in the oven and we made do with fried chicken – personally, that’s one of my favorite Thanksgiving memories and I really have to tell you guys that story soon! But, family cooking drama aside, Friendsgiving is always fun because instead of the regular traditional dishes that you might always have at home, with friends you’re free to experiment. I especially like it when I get invited to a potluck Friendsgiving because I know it means that I’ll get to eat so many different things and if you know me, I’m obsessed with variety at meals. Give me sixteen different dishes, and I’ll have a tiny bit of everything on my plate, no shame! 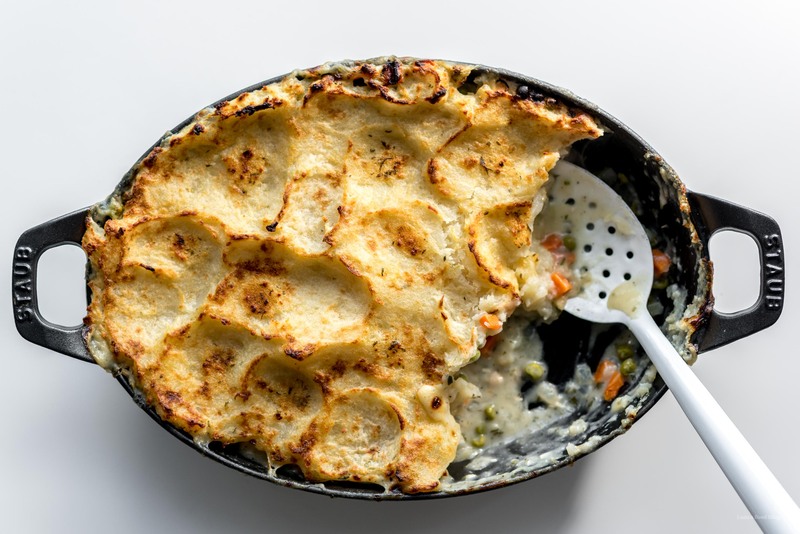 Land O’Lakes asked me to create a Friendsgiving recipe worthy of sharing and I came up with this potato topped turkey pot pie combo. 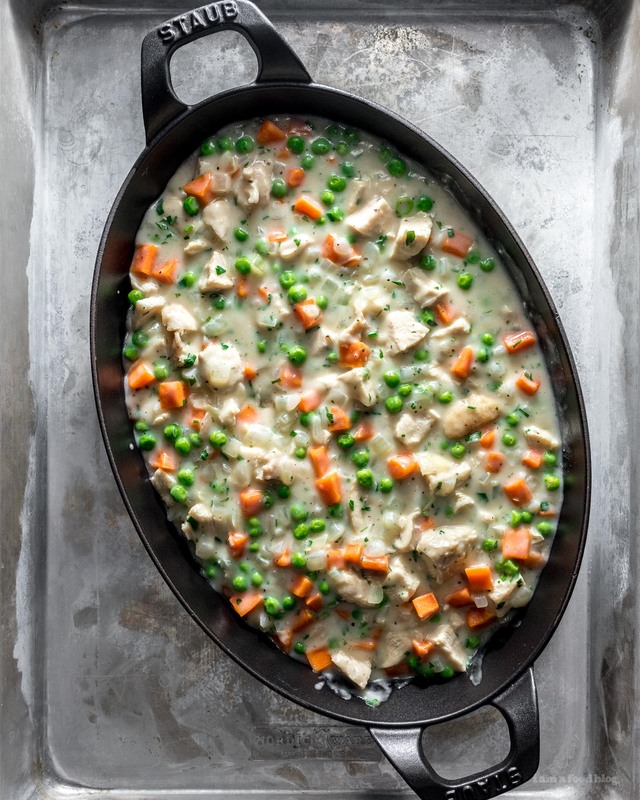 The bottom is what you’d expect of a traditional turkey pot pie: creamy béchamel, chunks of tender turkey, onions, carrots, and peas. Then on top, it’s a mashed potato party! I love that it’s kind of like a turkey dinner on your plate. The best part of Thanksgiving, for me, is always (always!) the fluffy buttery mashed potatoes. I’m a mashed potato fiend. I used to beg my mom to lick the masher when she made mash, much like kids beg to lick frosting off whisks. Happy Friendsgiving Friends! May it be full of mashed potatoes and butter. PS – Please check out Tessa’s post right here! Place peeled, cut and rinsed off potatoes in a pot with the garlic and cover with water. Salt the water and bring to a boil. Reduce the heat to maintain a simmer and cook for 15-20 minutes or until fork tender. 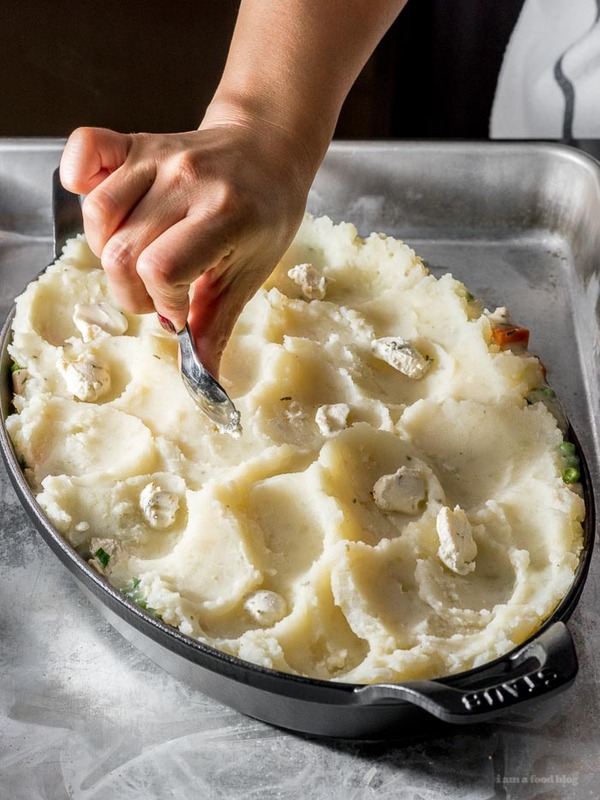 While the potatoes are cooking, make the pie filling: Melt the butter with canola oil in a large, heavy-bottomed skillet over medium-high heat. Add the onions and carrot and cook until tender, but not brown, about 5-7 minutes. Stir in the garlic. Sprinkle the flour on and stir to incorporate. Pour the chicken stock in a thin stream into the skillet, whisking constantly. Bring to a simmer to thicken. Add the turkey and simmer, stirring often, until the sauce is thickened and turkey is warmed through, about 5-10 minutes. 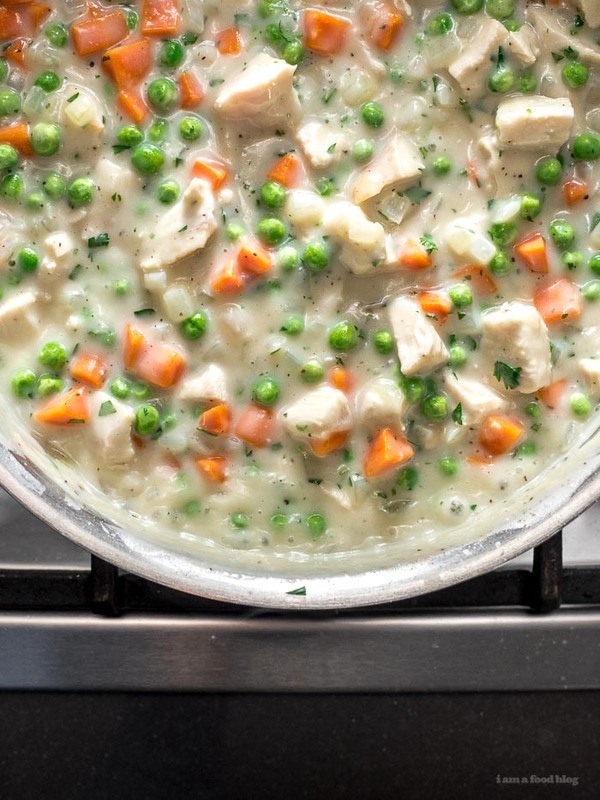 Stir in the peas, parsley, and salt and pepper, and then place in your oven proof casserole dish, spreading and smoothing out evenly. When the potatoes are cooked, drain well and return to the pot. Over very, very low heat, mash the potatoes and garlic with the butter. Stir in the milk until desired consistency. (I like a pretty stiff mash for shepherd’s pie.) Don’t over work the potatoes! 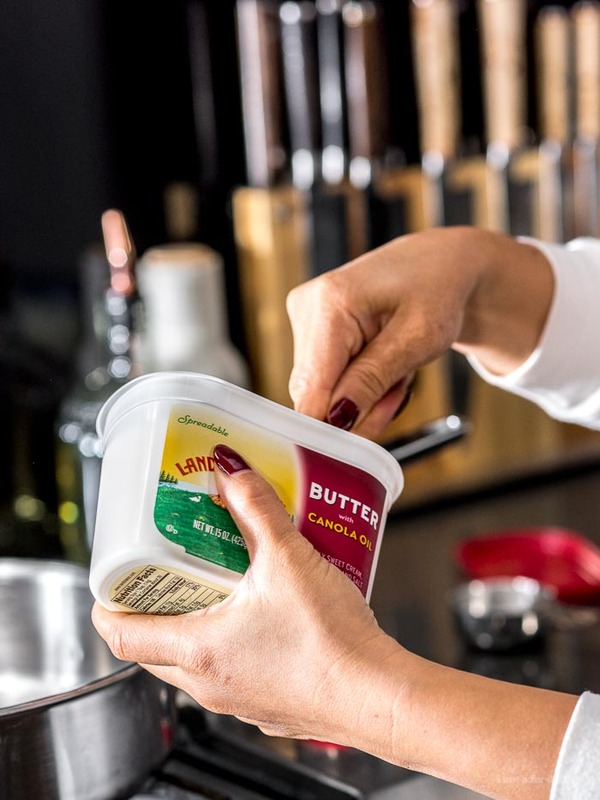 Taste and season generously, adjusting butter and milk as needed. Top the turkey mixture with the mashed potatoes and dot with tiny cubes of butter, if desired. 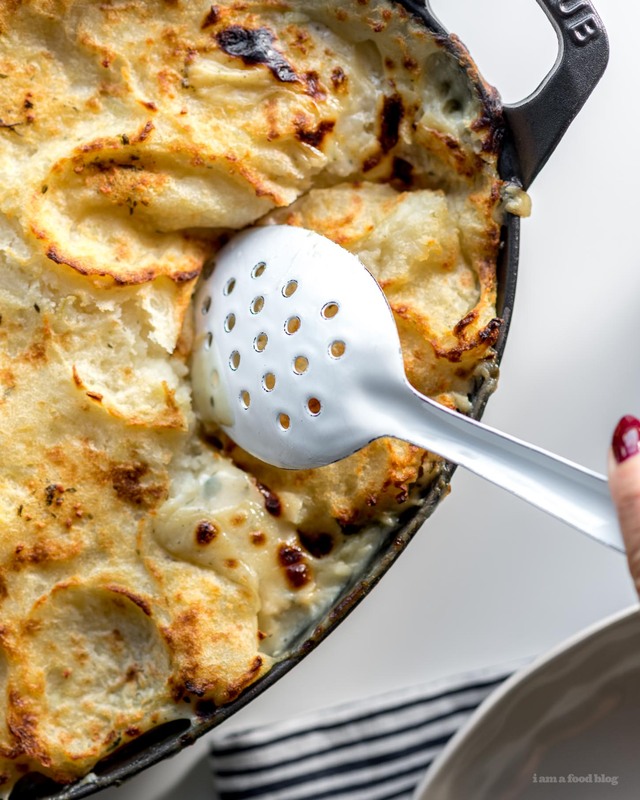 Bake, on a rimmed baking sheet to catch drips, until the potatoes are golden brown and crispy, about 30 minutes. If needed, broil for 5-8 minutes for an extra golden potato top. Enjoy warm! 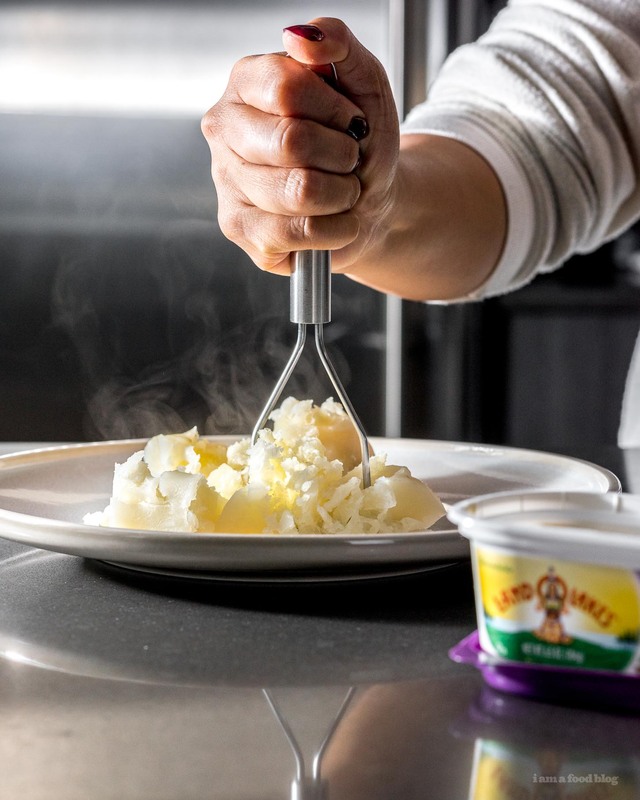 I partnered with Land O’Lakes to create this post. Thank you! 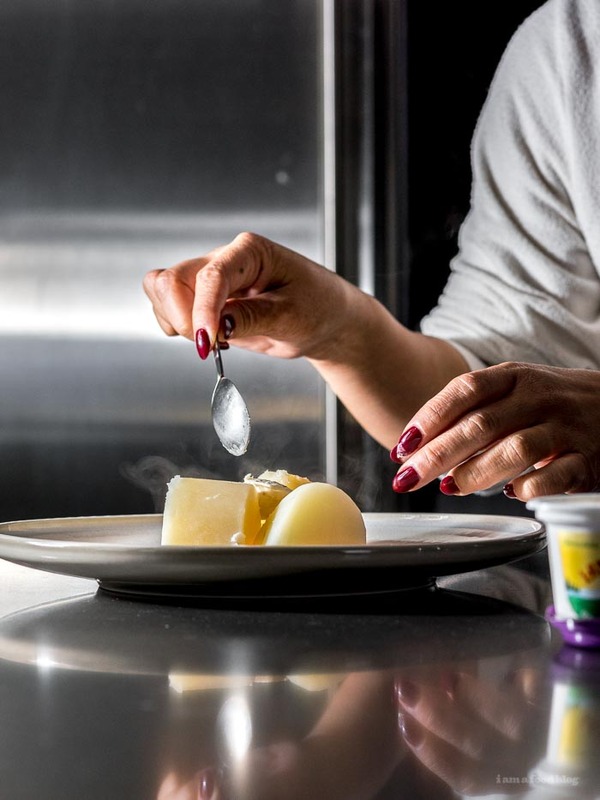 Hi, I was planning to roast the garlic for my mashed potatoes this year – and sorry, but I can’t listen to the video at work – but I noticed that it had a tip pop up – cook the garlic in the water instead of roasting! That intrigued me, what’s the benefit of doing that? Thanks in advance! I prepared 6 of these in small cast iron pots. Followed the recipe to a Tee. Marvelous idea. I must admit I took credit,:) Love what you’re doing. Best food blog out there. Hi Steph! Happy Thanksgiving! Do you think I could make this dish and freeze it? I’m thinking of making it for a party, but it’s not for another week. Or would it be better to freeze the turkey itself and then make the dish on the day of? Can I freeze mashed potatoes? 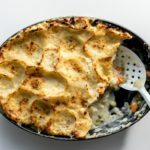 i’ve never frozen mashed potatoes but i don’t see why it wouldn’t work – i see frozen potato topped things in the freezer section at the grocery store all the time. but, it might be better just to make the base, freeze that, then do the potatoes the day of so the potatoes are nice and fresh. if you have time the day of, i would just freeze the turkey as is, then make the whole pie (base and potato topping) the day of the party. hope that helps!